Find the faults and correct the router configurations to provide full connectivity between the routers. Following are the IP-address schemes of all the routers in the following network. 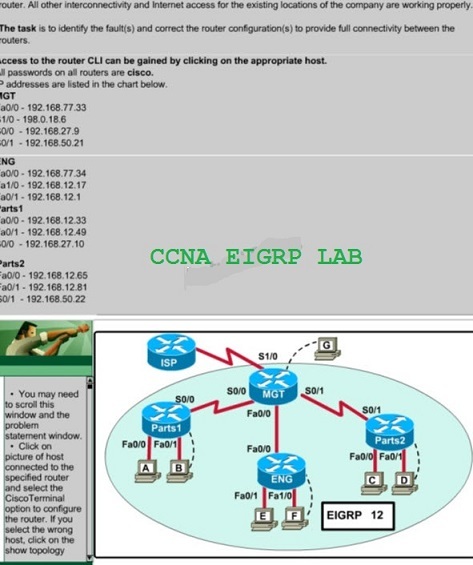 This the very simple Lab to configure in the CCNA Exam, all you have to do to advertise the EIGRP network of new added router “ENG” on MGT router. As MGT is the main router which is connecting all the routers to ISP. In our scenario on ENG the interface which is connected to MGT have the IP address of 192.168.77.x, so we will advertise this network on MGT router in EIGRP 12. So you are required the following configuration for compleing the above EIGRP lab.